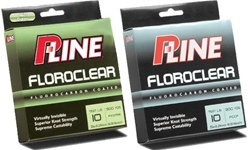 Floroclear With Floroclear's fluorocarbon coating the line is virtually invisible once it enters the water. This gives anglers the advantage of a more stealthy presentation, which will guarantee more strikes and hookups. From small finesse baits for bass to huge plugs for stripers in the surf, this line just plain casts. Floroclear Mist Green: New for 2009 Floroclear will be avaiable in mist green. With all the same qualities that have made this one of our most popular lines, Floroclear Mist Green gives anglers the advantage of a more stealthy presentation in a new variety of water conditions, which will guarantee more strikes and hookups.